There are many factors that are involved with installing a hardwood floor. 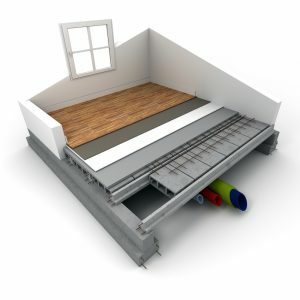 One of the most important aspects is the proper installation of the subfloor. Even though the subfloor is not seen after the floor has been laid, it plays an important role as the foundation of the floor. A subfloor cannot be thrown down carelessly. It is important that the installer makes sure the subfloor is level before the floor is put down. Here are five important reasons for wood subfloor leveling. It stands to reason that for a hardwood floor (or any type of floor) to be level, the structure it lies on must also be level. It is impossible for a floor to be perfectly level if the installer did not take the time to ensure that the subfloor was level. If the subfloor is not level, the main floor that is utilized by everyone in the house can have dips, humps or other inconsistencies. It can be problematic to have a floor with these types of issues since it can cause problems for people who walk on it and it might also be difficult to maneuver furniture around it. Hardwood floors must be installed by someone. Expert do-it-yourself people who are looking for a major project may be able to tackle the job on their own. However, most homeowners are not quite that handy. They always have the option to hire someone to do the work for them. Either way, hardwood flooring installation often requires many man hours of labor. Even the most adept hardwood floor layer can encounter numerous issues that can make the job complicated. Working with a level subfloor can make this difficult job easier. Homeowners have a basic expectation that the floors in their home are going to be flat and level. Floors that appear wavy or warped can affect the appearance of a home. No one wants to have to constantly look at floors that are obviously not level or flat. It is also unattractive to have physical evidence such a high and low spots. Sometimes subfloors that are not level cause the floor above to have wavy marks that are impossible to cover with stain, finish or paint. It is a far better option to make sure the subfloor is level so the beauty of the floor above can shine through. Even if you are not planning on selling your home, you should always be concerned with the overall resale value of it. If the subfloors underneath your hardwood floors are not level, it will be evident to the naked eye. If you are trying to sell your home, it is likely that many potential homebuyers will notice the fact that the floors are not level. Selling your home could be more difficult, and you may have to resort to lowering the price before someone will buy the house. If you are not planning on moving, the value of your home is still important. If you are in need of a home equity loan or need to use your house as collateral, the monetary value will be of the utmost importance. Making sure your subfloor is level before you lay down a hardwood floor can save you money in the long run. If the subflooring is not level, it will have a negative impact on the hardwood floor that sits above it. Even if the issues are tolerable for awhile, at some point they will need to be addressed and fixed. If a hardwood floor is already laid, it will mean tearing up the existing floor to gain access to the subfloor, which can be a costly venture. It will cost additional money to replace the floor with new planks since the old ones will no longer be usable. It is a far better option to make sure the subfloor is level, so you do not need to go to the expense of tearing up and replacing your hardwood floor. Anyone who invests money into installing hardwood floors wants to make sure they look as good as they can and they last for many years to come. One way to get the most out of your hardwood floors is to make sure your subfloors are level before the floor goes down. If you have questions regarding subfloors and how to make sure they are level, work with a flooring professional to help you determine what needs to be done. Thank you for reading our blog. How can we help you? Contact us today.